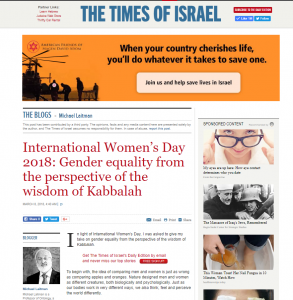 In light of International Women’s Day, I was asked to give my take on gender equality from the perspective of the wisdom of Kabbalah. To begin with, the idea of comparing men and women is just as wrong as comparing apples and oranges. Nature designed men and women as different creatures, both biologically and psychologically. Just as our bodies work in very different ways, we also think, feel and perceive the world differently. Therefore, the attempt to make men and women one and the same is completely unnatural. By trying to judge men and women by the same standards, and equalize them as much as possible, it’s as if we are trying to “fix” nature. And nature doesn’t need any fixing. Rather than trying to level the differences between men and women, we need to learn how to embrace them. We should aim for harmony – not equality. That is, we have to upgrade our view on gender equality to a more holistic approach, to see how it is precisely our differences that make us capable of complementing each other to create harmony. The whole of nature works that way – unique and opposite qualities are woven together to create life – plus and minus, contraction and expansion, heat and cold, ebb and flow, male and female. In fact, I believe this is something that women understand a lot better than men, since they are generally more sensitive to nature than men. On the practical level, I’m not saying that men and women can’t serve in the same roles in society. Examples such as Margaret Thatcher and Angela Merkel prove that a capable woman can find herself in a position that was typically occupied by a man. However, placing a woman in a certain position just because it makes things look more “equal” is foolish and won’t do any good to society. For instance, when a steering committee is asked to have an equal amount of men and women for the sake of “equality,” it is a childish perception of equality that aims for political correctness rather than optimal results. A steering committee could have a majority of men or a majority of women, depending on what the committee needs to achieve, and what each person brings to the table – not how we can make a poster of equality. Western society needs more education about how various systems of nature achieve harmony when differences come together. Then, we will see that what we should strive for in society is mutual complementation, which means highlighting the unique qualities of men and women, and weaving them together to achieve the best of both worlds. I invite you to take our free Kabbalah course and learn for yourself how to uncover your unique qualities for the benefit of all.